3DTTM is a porous titanium co-forming technique developed by Praxis Technology specifically for orthopaedic implants and produces a versatile, tailorable surface to a titanium injection-molded component in one step. To create your desired surface, we place an additively manufactured sacrificial insert into the mold to simultaneously co-form the porous surface to the solid titanium component. 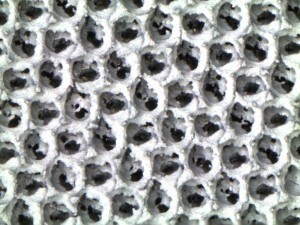 This innovative approach allows net shape forming of the porous surface texture and solid part in one molding process. After molding, the sacrificial insert is removed and the product is processed similarly to a conventional metal injection molding process. The versatility of additive manufacturing allows unprecedented control of the molded surface. This surface can be engineered to be an ingrowth, ongrowth or polymer anchoring surface. Since the entire surface is defined by the sacrificial insert, the nature of the surface texture, porous section and interface between the porous and solid sections can be controlled. By incorporating sacrificial inserts onto a component manufactured by Titanium Injection Molding, complicated internal geometries or undercuts are easily formed. Sacrificial inserts make the Titanium Injection Molding process even more flexible from a design standpoint. Geometries that would be considered impossible or prohibitively expensive can be molded into the part in a net shape fashion. This allows increased complexity and decreased weight in a variety of components. 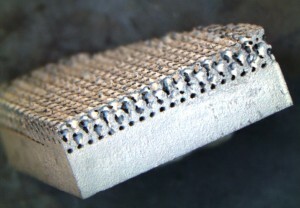 Using an additive manufacturing process, Praxis creates sacrificial negatives of an integration surface. As the feedstock is forced into the mold, it flows into the insert. The insert is subsequently removed, leaving behind a network of interconnected passages with precise pore sizes and porosity. Additionally, sacrificial inserts can be used to create hollow sections within a molded part for the purpose of decreasing weight or creating complicated geometries. Biocompatibility: the device should support normal cellular activity without any local and systemic toxic effects to the host tissue; it must be osteo-conductive and osteo-inductive and be able to induce blood vessels formation within or around the implant. Furthermore it should produce an immune system response. Mechanical properties: the device should offer mechanical properties similar to the host bone with a sufficient mechanical strength. Bone responds to the absence and presence of physical load. In response to these loads, the body either absorbs or forms to the bone. 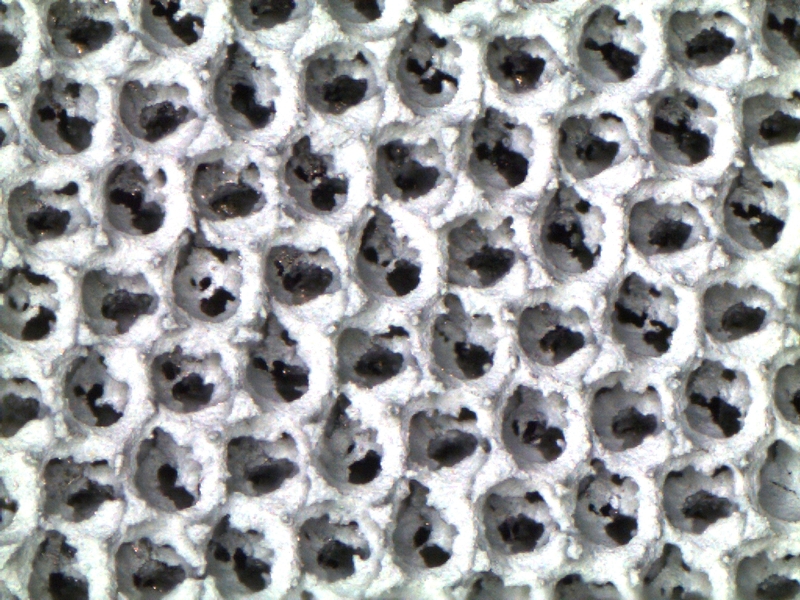 Pore size: Titanium implant surface scaffolds should have an interconnected pore size between 100–500 micrometers. Three dimensional ingrowth surface manufactured using 3DT technology. Cost: Moreover, manufacturing costs of these materials is comparable to conventional technologies, and implantation is relatively simple, precise and reproducible. Ti-6Al-4V (Grade 5) alloy is widely used to manufacture titanium implants. The addition of alloying elements to titanium enables the device to have a wide range of properties such as good weldability, excellent strength characteristics and oxidation resistance. 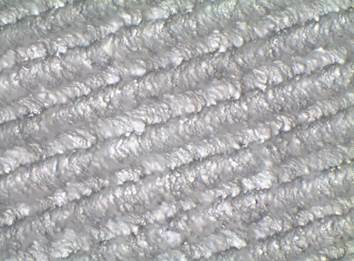 Close-up of highly interconnected ingrowth medium and fixation surface. Ingrowth surfaces demonstrate the fullest potential of the 3DT Technology. 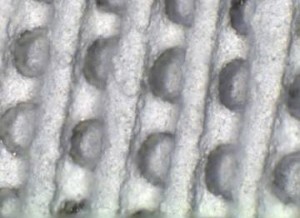 Uncemented devices require a particular rough surface with a layer of interconnected porosity to aid initial fixation during implantation. This particular texture allows the ingrowth surface to scrape bone and tissue matter into the porosity to give osseo-integration a head start and improve healing times. With Praxis’ porous titanium 3DT Technology, net-shape texture is attainable. 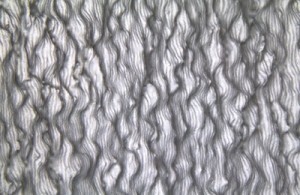 Ongrowth surface created using 3DT technology. Cemented devices require a rough surface with low complexity, often known as an ongrowth surface. Praxis’ 3DT Technology co-forms the ongrowth surface with the titanium implant body with no existing boundary. Due to the nature of the ongrowth surface, it can be applied to undercuts, inner diameters and other difficult to reach areas. 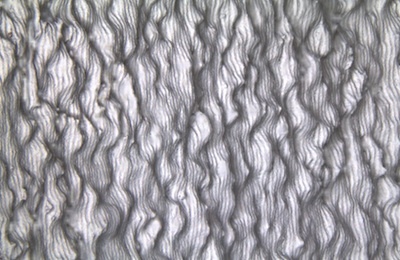 Ongrowth surfaces are also highly repeatable and tailorable. Polymer anchoring surface with interlocking loops providing loops that the polymer can flow around to anchor to the surface. Undercut surface for use as a polymer anchoring layer. Monoblock or unitized devices require a surface to aid UHMWPE bonding. Interlocking loops and undercut Polymer Anchoring layers created using Praxis’ 3DT Technology provide very strong bonds to medical devices manufactured using Titanium Injection Molding.